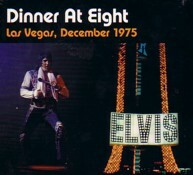 December 1975 saw Elvis performing at his 14th Las Vegas season. There is no doubt that any novelty of these Hilton audiences had worn thin years before and in fact this rare Christmas season was compensation for the earlier August trip that had to be cancelled after just 5 shows with Elvis being rushed to hospital. Elvis had recuperated and relaxed for the rest of the autumn, Linda Thompson had returned after a brief break, and he had also taken delivery of the Lisa Marie jet in November so things were again looking up. Elvis was definitely in good voice during these concerts and he also seemed to be enjoying being back on stage. However Elvis always preferred the Midnight concerts to the Dinner Shows (who would want to sing while everyone rattled their cutlery?) and the bootleg of this day's midnight show, 'Just Pretend', has been available for many years. Luckily for us Lisa Marie and Linda Thompson were in the audience this night of Dec 13th which might have inspired Elvis a little more than normal but it still takes a while for him to warm up. Elvis' shows in 1975 were often a little shambolic and unfortunately these expectations are reinforced by a mess-up in the first seconds of the CD. Elvis stops because his microphone is off and they all have to start again. It's a bad start and I wish that FTD had left this off the disc as it does seem unnecessary. The real bonus of this CD is that it was recorded on a reel-to-reel tape and is of far better quality than anything FTD has yet found from Vegas in 1975. However while the sound quality is excellent Elvis does seem to be waking himself up for the first few songs and the highlights really start from halfway through the show. 'C.C. Rider' and 'I Got a Woman' are average 75 versions and when Elvis talks he sounds a little tired and suggests that, "I'm like a deranged alligator". What was on Elvis' mind? James Burton is playing the start of 'Love Me' wondering exactly the same & where this might be leading. 'Help me Make it Through the Night' is a request done for Linda Thompson's parents and it is a nice live version. Elvis also becomes more engaged for an excellent 'Trying to Get to You' followed by a delicious 'And I Love You So'. The oldies get their regular unexciting work-out before someone interests Elvis by showing him the recent British release of the 'Sun Sessions' LP. Elvis has never seen this before so is amazed. It's a nice open moment and he says "Can I see that album for a second? I have never seen it before ... The Sun collection? That's the first five records I recorded". The next surprise is that Elvis attempts a roughish 'Wooden Heart'. He explains "I did that for the kids in the audience and my little daughter Lisa's out there. She's 7 years old". Although a very rare live song this unfortunately cannot be compared to the 'Danny Boy' show stopper on the otherwise terribly sad 'Tucson 76'. A fair version of 'You Gave Me a Mountain' follows before things get funky with a great 'Polk Salad'. This seems to be where Elvis connects (or wakes up!) as the show really picks up at this point. Bass player Jerry Scheff had returned in 75 and it shows! The rhythm and brass section really go for it and as Elvis says at the end "Phew!" The introductions are a long 8 minutes but you can hear Elvis joining in and really enjoying Jerry's blues solo and on 'School Days' there is another rare moment when Elvis acknowledges the Jo Guercio orchestra's guitarist Tony Freeman and asks him to play a solo. A powerful performance of 'How Great Thou Art' follows (with slight tape distortion) along with the touching 'Softly As I Leave you'. As no studio recording of 'America' exists this night's performance of the song is the nearest to a perfect version that we are even going to get. Introduced for the bicentennial year Elvis sings this with a passion he would usually reserve for 'American Trilogy'. Interestingly both 'Softly As I leave You' and 'America' from the Midnight performance bootleg, Just Pretend, would be released on singles after Elvis' death. The audio quality of this tape undoubtedly surpasses the cassette bootleg of the Midnight Show however Elvis was certainly more engaged later that evening. With no deadline and Linda still in the audience he added a fabulous & rare 'Just Pretend' as well as having the extra enthusiasm to throw in 'Burning Love', 'Little Darlin'', a rockin' 'Little Sister' and shows his appreciation of 'How Great Thou Art' by performing a reprise. Maybe Elvis also needed the challenge of a new and larger audience because Elvis sounded in better form and in better humour on the May 75 Tour released previously on the FTD 'Dixieland Rocks'. There the excitement of the crowd is really palpable and Elvis sounds far more awake and excited. He also performed classics such as 'The Wonder of You' & 'I'll Remember You' while including newer songs such as 'My Boy' and 'TROUBLE'. 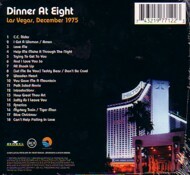 It is great that FTD have said that they will "try to document every major Las Vegas, Lake Tahoe season or concert Tour by one CD" and 'Dinner At Eight' certainly deserves a release just for the technical quality. However it is also an obvious shame that they missed running a reel-to-reel across the final show of the night or, even better, the season's Closing Show. However, you never know what may turn up in the future! FTD 'Dragonheart' Oct 1st South Bend review. 3 days after College Park!